It’s Always Sunny in Philadelphia – NAHT! Since I could go on about this all day, I’ll keep it brief. This is a horrible set of moves. If I were a Flyers fan, I’d have a heart attack, followed by a seizure, followed by a killing spree through the Flyers front office, followed by another heart attack. That’s probably the best way to describe it. I’ve never really been a huge Flyer fan (other than for fantasy purposes), but I always loved Mike Richards. 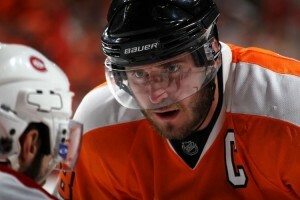 In my opinion, he’s the best captain, and best two-way player in the league. He has the talent of a first line centre, including great speed, passing, vision, shot, etc etc. He kills penalties, is physical, wins draws, scores big goals. He does everything. He signed a 12 year deal in 2008 which should have made him a Flyer for life. Now he’s a King, and the return, while not necessarily bad, is a massive risk for the Flyers. Schenn is very famous for a prospect his age, but the fact remains that he’s only just coming out of junior. He looks like he’ll be a solid 2nd line centre at the worst, but there’s no guarantee that he’ll be an impact player like Richards. Simmonds meanwhile is a very good 3rd line winger with second line potential. Big, fast, strong, 2-way winger who can put up 25 goals and 50 points and dominate on the forecheck and the pk. Very valuable. But Mike Richards is one of a kind. I was never a huge fan of Jeff Carter. I always thought he’d be a player that was more talented than his statistics would bear out. Although he did prove me wrong in 08-09 when he put up 46 goals (2nd in the league) and 84 points, he hasn’t been super-productive in the other 5 years, particularly in the playoffs. That being said, this deal is odd. Jakub Voracek is a talented 22-year-old Czech forward drafted 7th overall in 2007. He has definite first line potential, and is already a second line winger. But he doesn’t seem to fit the Philadelphia mould. The 8th overall pick could be Hamilton or Murphy, but neither are sure bets to be impact players. Carter’s skill set is irreplaceable – he’s exactly what GM’s drool over at the draft – big, fast, skilled, great goal scorer. They don’t grow on trees. The only thing more rare is #1 d-men who are 6’3, skate like the wind, and run both sets of special teams. If you hear the argument “this was done to open up cap space”, that is *utter BS*. The Flyers got rid of $11M in salary between Carter and Richards. Voracek and Simmonds are RFA’s, and I would expect them to get around $3.5M collectively. Schenn’s entry-level contract is $3.1M with rookie bonuses, which supposedly count against the cap. (Not 100% confirmed – some years they haven’t counted unless the bonuses were actually reached, but the NHL has tried to ensure that they count regardless). Then they signed Bryzgalov for a $5.66M cap hit (over 9 years!). Now they’ve spent $12.25M. This entry was posted in Uncategorized and tagged Bobby Clarke, Brayden Schenn, Dougie Hamilton, Ed Snyder, Flyers GM Paul Holmgren, Jakub Voracek, Jeff Carter, Jeff Carter trade, Mike Holmgren, Mike Holmgren drug overdose, Mike Holmgren insane, Mike Holmgren lost his mind, Mike Richards, Mike Richards trade, Phialdelphia owner Ed Schneider, Philadelphia Flyers, Philadelphia Flyers GM, Philadelphia Flyers lost their minds, Philadelphia Flyers trade, Ryan Murphy, Wayne Simmonds by Peter Siamandas. Bookmark the permalink.